For our family, nothing says Thanksgiving quite like this simple but insanely yummy and craveable Candied Yams recipe! This recipe was my Grandma Annie’s that’s been passed down to my mom, and now to me. I’m not sure how similar it is to other candied yam recipes, but since I’ve only had one other version that my Mother. In. Love. makes with sweet potatoes, I’m not really one to know. What I do know is that when I’m celebrating the holidays with my mom, this dish better be on the table. For as long as I can remember, my mom has always made these yummy yams for Thanksgiving and Christmas. It was the one dish that I looked forward to more than any of the others. It just isn’t a holiday dinner without them. 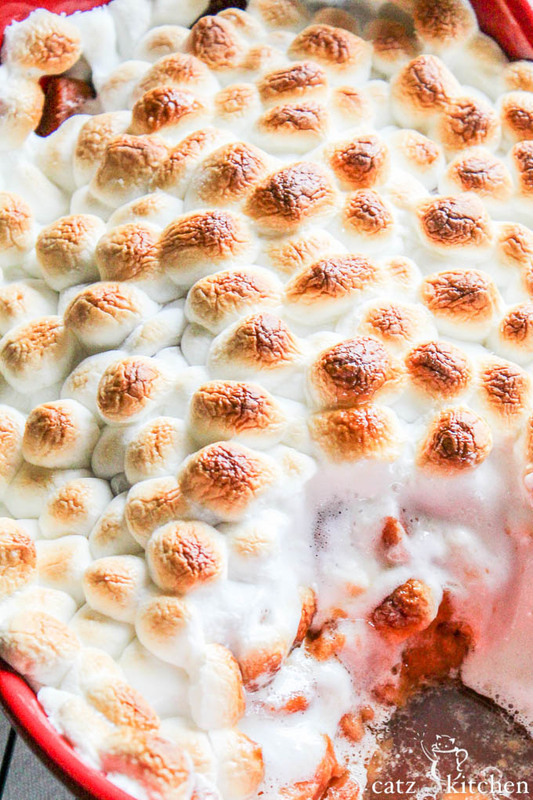 The best part of this dish is undoubtedly those beautiful toasted marshmallows on top, but hidden underneath that toasted fluff, are soft, buttery, sugary yams! There isn’t a part of this holiday favorite that isn’t to be loved. It’s easy to prepare and the marshmallows are easy to toast (as long as you keep your eye on the oven and don’t walk away. Heehee, that’s always the tricky part with holiday cooking, isn’t it? This fun red casserole dish is one of Rachael Ray’s “Bubble & Browns,” which are not only pretty, but easy to clean and versatile, for those of you who have asked! Update (Nov 2017): It seems that these are hard to find on Amazon anymore (though there are still some colors available), so here’s a link to them on Target as well (though the selection seems to be limited everywhere). Pre-heat oven to 350 degrees. Grease a casserole dish. Cut yams into slices and lay on the bottom of your dish. Sprinkle ground nutmeg over the potatoes, crumble the brown sugar over the potatoes and dot the butter over the brown sugar. Bake in the oven for 15-20 minutes, until hot all the way through. Remove the casserole dish from the oven and turn on the broil. Meanwhile, top the dish with mini marshmallows making sure there aren't any uncovered spots. 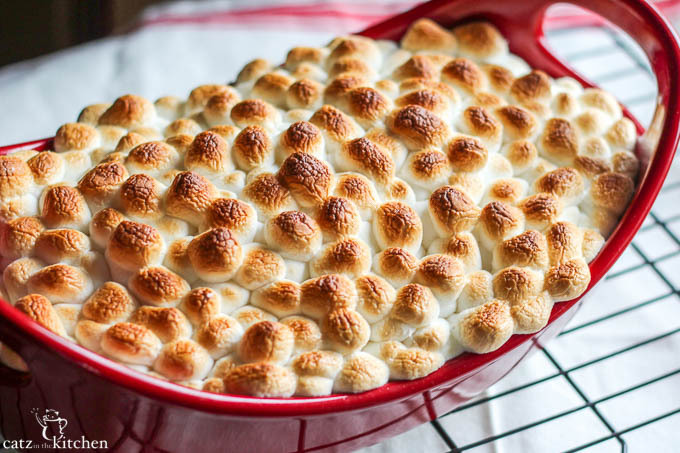 Return dish to oven and broil for 3-5 minutes or until the marshmallows are toasted. DO NOT WALK AWAY! Nutmeg? Mom & I never put nutmeg in ours! Awesome! We love it - hope you do, too! Let us know! Good luck! :) Happy Thanksgiving! I use the zest of an orange and sweetened condensed milk as well, it is so yummy! I have two kids and it is what they look forward to. Ooh, that sounds yummy! I love the orange zest idea! This looks amazing! If I use 4 29 oz cans should I just double the recipe? Thanks in advance! Happy holidays. Hi Jessi- I don't think you would need to double the recipe, just adjust the rest of the ingredients. Maybe add 1-2 more tablespoons of brown sugar, another tablespoon and a half of butter and 1 more teaspoon of nutmeg. Make sure the casserole dish your using is big enough to hold all the yams without spilling over, because that could make a mess in your oven. 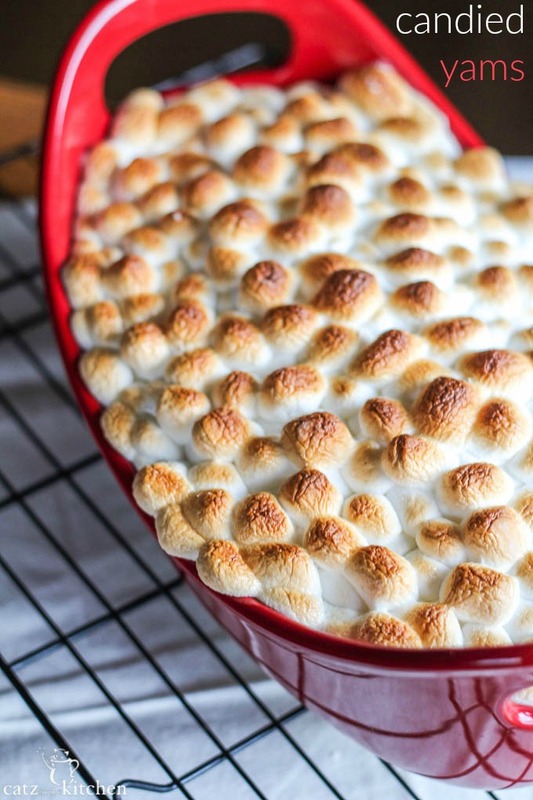 Put a baking sheet under the baking dish if you think that could happen, and just add more marshmallows to cover if needed. But watch em to make sure they don't burn! I hope that helps and have a wonderful Thanksgiving! So, if i use fresh yams, would about 4-5 be enough? Good morning, Vicky. Chels and I were just talking this over. Though we cook with fresh yams and sweet potatoes all the time, we've actually never tried using them for this recipe! However, I checked some resources for canned-to-fresh measurement conversions, and they seemed to indicate that four fresh yams would be the equivalent of 2-3 cans worth. So, I think you're on the right track. Maybe go ahead and do five - that way, your worst case scenario is you have too much! Enjoy! Hello and happy holidays! So I'm planning to make this dish for thanksgiving but I have a slight problem. I work tomorrow (thanksgiving) and I won't have time to make it before or after work. I was thinking of baking it tonight and then tomorrow putting it back in the oven to warm up and then also to add the marshmallows last. Would it still be good that way? Any suggestions on how to make it work? By the way I work from 8 to 5 and then I'm driving for about an hour to my aunt's house where we're having dinner. Thank you in advance for your help! I hope it turns out as beautiful as yours in the picture. Happy Thanksgiving everyone!! I decided to make this candied yams dish today for a potluck at our friends. Even though I do not like yams, and marshmellows, my hubby asked if I could make this for him. I was so glad that this ended up to be a very simple recipe and did not take much time to prepare. Everything worked out GREAT and all who tried some said it is fabulous. They absolutely love the combination of brown sugar and nutmeg. Wouldn't change a thing. May end up using this recipe again for Christmas. Thank you very much for sharing this recipe on Pinterest. I am looking forward to trying this recipe. I just have one crazy question...light brown sugar or dark?! :) TIA! Have you added pecans or walnuts to this? I haven't, thought I've thought about it before. I bet it would give a delicious texture to the potatoes. If you do that, I would roast them for about 10 min before hand. They'll release their oils and get all smoky and nutty. Such a delicious flavor! Hello! I love the Rachel Ray casserole dish you used with this recipe! What size dish did you use? I plan to make this dish for thanksgiving and would love to use this same dish! Thanks! Goodmorning. Do you drain the juice from the canned yams?? Forgot, yes nutmeg and I put in cinnamon and a little ginger too, I love the combination of those three spices. I see some comments where they wouldn't, but I say yes, nutmeg is essential and adds more flavor. Silly question - But do you leave the yams as cubes or did you mash them up? First time I am making yams for Thanksgiving. Thanks!!! Hi, Chloe - not a silly question! I'm sitting here next to Chels and asked her - she says to leave them cubed! And don't worry about getting all of the cubes exactly the same size. Candied yams should be a bit of a rustic dish. :) Enjoy, and please comment back if you have any other questions!